The exact origin of this temple is unknown, but it is believed to have originated from the early Rattanakosin era or late Ayutthaya period. The exact origin of this temple is unknown, but it is believed to have originated from the early Rattanakosin era or late Ayutthaya period. 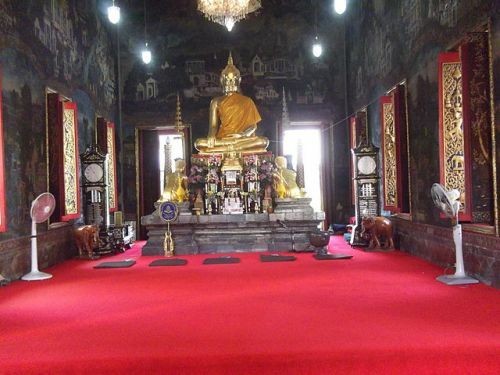 It had several names, but got its permanent name during the reign of King Rama IV, who extensively renovated it and raised its status to a third-grade royal temple. The temple takes up a vast amount of space and has an extensive courtyard. The murals inside the ordination hall show a set of Buddhist pilgrims. The large reclining Buddha is worth seeing. Thai people come over to place small bills of money next to it as they believe it brings good luck.